Book a skilled lawn pro in River Oaks. Backed by a total satisfaction guarantee and amazing customer support. 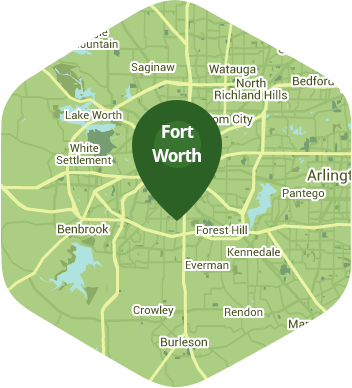 In River Oaks, your idea of fun might be heading into Fort Worth to take in all it has to offer, or maybe it might just be heading down to Griffs for a burger and some fries with your family. Whatever your idea of fun might be, it probably doesn't involve lawn care! Free time away from work isn't meant to involve more work, even if it's just mowing your grass – and that's why Lawn Love is here. Lawn Love is a fully insured and bonded lawn care service. Our experienced and knowledgeable lawn care technicians can take care of all your lawn care needs. Whether you need someone to mow your lawn every week or someone to aerate and fertilize your lawn, Lawn Love's technicians can take of it and everything in between. If you think only the fabulously wealthy can afford a lawn care service, then you need to call Lawn Love. Our free, fast and easy two-minute quote is just a phone call away. Call us today at 817-345-6362 and find out how a much a little Lawn Love can do for you! Rated 4.73 / 5 stars in 4,082 River Oaks customer reviews. There won't be any rain in River Oaks today, which means you'll probably have to water your lawn. Dusk and dawn are the best times to water your lawn (the sun will rise at 6:56 AM and set at 8:01 PM today in River Oaks). Here are some average lawn care prices for homes in River Oaks. Average lawn size 6,138 sq. ft.